Matthew Muller, the man who has now been a suspect in a high-profile Vallejo kidnap case since FBI documents surfaced in July, made his first appearance in federal court in Sacramento on Monday in connection with the abduction of a woman this spring. Muller, 38, appeared in a packed courtroom as he was formally charged with kidnapping Vallejo physical therapist Denise Huskins from her Mare Island home in March. Prosecutors now have 14 days to issue an indictment that could include more charges. Both Huskins and her boyfriend, Aaron Quinn, reported being drugged and held for ransom. Huskins had also told the FBI she had been sexually assaulted, twice, but no criminal charges have been filed stemming from that allegation. Muller's attorney, Tom Johnson, told NBC Bay Area that his client will eventually plead not guilty. Johnson has also stressed in previous interviews that his client, a Harvard-trained lawyer, has suffered from mental illness most of his adult life. 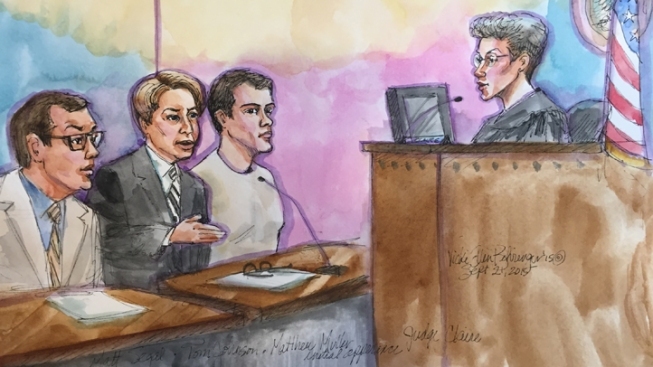 Family friend Steve Reed attended the court hearing, describing Muller as "fragile," and noting that the young man has always been a "high achiever," who comes from an "outstanding family." Muller could face a maximum of 20 years in prison if convicted of the kidnap charge. When both Huskins and Quinn were set free, the Vallejo police ended up not believing their tale, which includes being allegedly drugged, sexually assaulted and held for ransom. The police told the public they thought the couple was lying. In response, on Thursday, the couple filed a claim against the city of Vallejo and police department, alleging that detectives bungled the criminal investigation and ruined their reputations. The claim was filed a day before Muller pleaded no contest in a separate June home invasion in Dublin, which police said had several similarities to the Vallejo kidnap case. A dropped cell phone in Dublin led a detective to Vallejo, to put the two cases together. Muller could serve a maximum of 11 years in prison for that crime. Palo Alto and Mountain View police have said that they are investigating Muller for a 2009 home invasion robbery that also bears some similarities to both the Vallejo and Dublin cases, after the robbers blindfolded a victim and took off without harming the person. As of Monday, Muller has not been arrested or charged in those Silicon Valley cases.